We reported on cedar-quince rust on hawthorns (Crataegus spp.) in a BYGL Alert! a couple of weeks ago [see "Rusty Hawthorns," June 14]. The disease is so common on hawthorns it's become an annual BYGL missive. However, we were surprised by recent observations of cedar-quince rust occurring on Callery pear (Pyrus calleryana). We noted in our hawthorn report how this fascinating fungus, Gymnosporangium clavipes, must alternate between two widely divergent taxonomic groups of plants in order complete both portions of its life cycle. One portion of the life cycle involves a member of the Juniperus genus. It's often Eastern Red Cedar (J. virginiana) which accounts for the "cedar" part of the disease name. The fungus produces twig cankers on junipers that are both noticeable and potentially damaging by disrupting vascular flow to cause twig dieback. Spores that arise from the cankers drift on the wind to initiate the other portion of this fungus' life cycle. However, if the spores land on another juniper, or oaks, maples, pines, gardeners, etc. nothing happens except perhaps for sneezing in the case of gardeners. The rosy side of the fungus' life cycle is revealed when the spores land on a member of the rose family (Rosaceae). Common quince (Cydonia oblonga) and flowering quince (Chaenomeles spp.) are possible rosaceous hosts, thus the "quince" in the disease name. However, spores that are produced on a rosaceous host can't infect another member of the family; they can only infect a member of the Juniperus genus. Junipers serve as the middleman among the many members of the rose family. According to Sinclair and Lyon in their 2nd edition of Diseases of Trees and Shrubs, "Rosaceous hosts include more than 480 species in 11 genera." 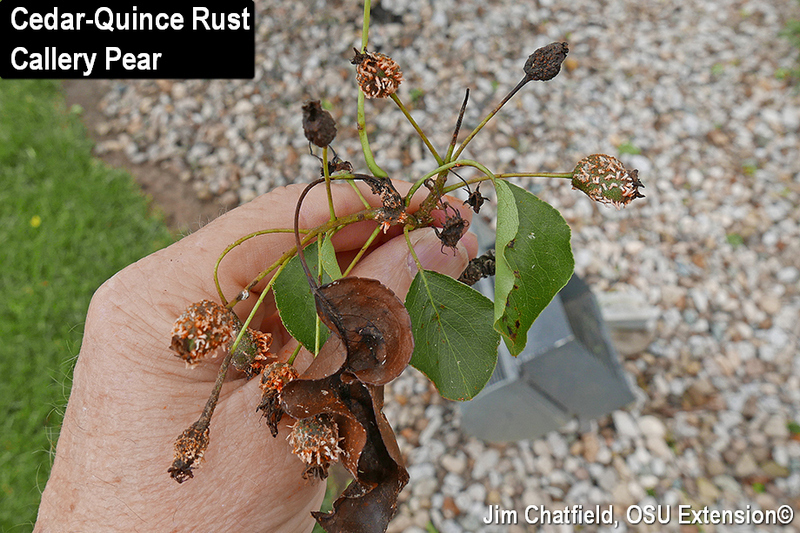 So, why were we surprised with observing cedar-quince rust on Callery pear in southwest Ohio and Louisville, KY? Frankly, we shouldn't have been; Pyrus is in the rose family. However, being a possible host and being a common host are two different things. Hawthorns are a common host as demonstrated by our almost annual reports of "rusty hawthorns" or "hairy hawthorn haws." We've also seen cedar-quince rust on Amelanchier, although less commonly. Ranges in host plant susceptibility are accounted for in the Disease Triangle. Remember that an adjustment to only one side of the Triangle such as having a less susceptible host can radically affect disease development. The elimination of just one side will eliminate the disease; a resistant host resists disease development. It's a powerful disease management concept. What about the "Environmental" side of the Triangle? Perhaps environmental conditions were particularly conducive to infections and disease development on Callery pears this spring. Conditions may have been less conducive during past years. Let's not forget the "Pathogen" leg of the Triangle: the pathogen must be present. Remember that junipers are the middleman between all of the cedar-quince rust fungus' rose hosts and eastern red cedars are common in southwest Ohio and across a wide swath of Kentucky including Louisville. We're asking for your help with learning more about cedar-quince rust on Callery pear. Would you please contact us with your observations including locations and disease intensity? Just click on our names at the top of this report to get our e-mail addresses. Acknowledgement: Ron Rothhaas (Arbor Doctor, LLC, Cincinnati, OH) jump-started our effort with sending two e-mails about rust on pears in southwest Ohio; the first on June 21.